Congress workers invoked her resemblance to grandmother Indira to welcome Priyanka Gandhi Vadra to Lucknow for her debut as Congress general secretary. Lucknow: Decked up in the Tricolour, a truck slowly made its way from the Lucknow airport to the Congress headquarters over the course of six hours Monday. Standing atop that truck, surrounded by hundreds waving the party flag stood one woman, seemingly a beacon of hope to a party that was a no-hoper till even weeks ago. 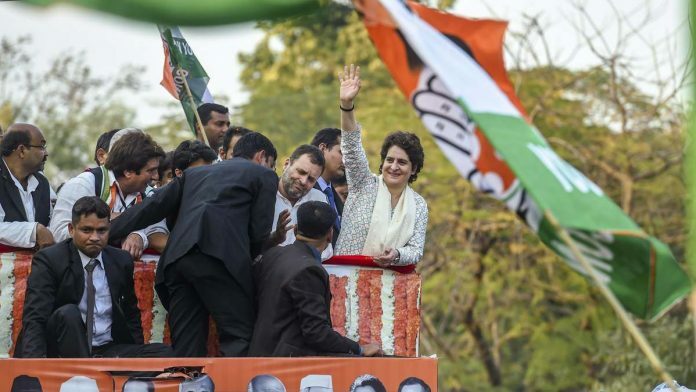 For Congress supporters, it is Priyanka’s resemblance to Indira Gandhi that is fuelling their belief in the newest entrant to India’s politics. The formula for change seems clear in the minds of Congress supporters — a Congress victory in the Lok Sabha polls, and pulling the country out of unemployment and poverty. “She has the charisma of her grandmother. All the old Congress workers and supporters see Indira Gandhi when they look at Priyanka and they call her Indira. Like Indiraji, who used to fulfil her promises, Priyanka Gandhi has the same persona,” said Poonam Sharma, part of the Congress’ Purvanchal Women’s Wing, who belongs to Gorakhpur. While she has been a part of political campaigns in Amethi and Rae Bareli for her family, this is Priyanka’s first visit to Lucknow, which has been a BJP stronghold since 1991. She is expected to interact with office-bearers and party workers from across UP at the state Congress headquarters in Lucknow over the next three days.